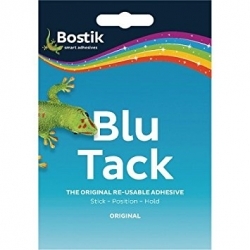 Bostik Blu Tack is a permanently plastic, reusable adhesive. Bostik Blu Tack is supplied in the form of rectangular slabs between sheets of release paper and packed in individual wallets. Bostik Blu Tack is clean and economical in use. Holds up posters, cards, children's paintings, party decorations, maps, messages, etc. Telephones and calculators to desks, ornaments to shelves, photos in albums, screws to screwdrivers, model parts during painting,etc. Holds safety pins, keys, screws, etc. flowers and candles in place for table and flower arrangements. Cleans fluff from fabric and dirt from typewriters, model railway tracks, etc. May be rolled and manipulated to make 3 dimensional artistic �models�. For use on non porous surfaces: vinyl coated wallpapers, painted surfaces, glass, and metal. I just used Blu Tack to put a picture in a frame. It was loose and I had to nail the back to keep it in. By adding a bit of Blu Tack the picture fit snugly and the Blu Tack held the nail for me to hammer in. Great stuff and has a lot more uses than just to hold posters on the wall.